ok, first of all, my asos (1 of 3) order came today and i heart everything! this ring.. can it be any BIGGER? i think NOT! secondly, my sissy Laura was so sweet and kind to send me this wonderful 'Wish' bracelet. it is gorgeous beyond words. can't thank you enough. check her blog out because she just did this 'i love tea' necklace with a matching tiny teaspoon. the girl has an eye for details, i tell ya! thirdly (lol), this was me yesterday. everything h&m except for the skirt. it's from asos. 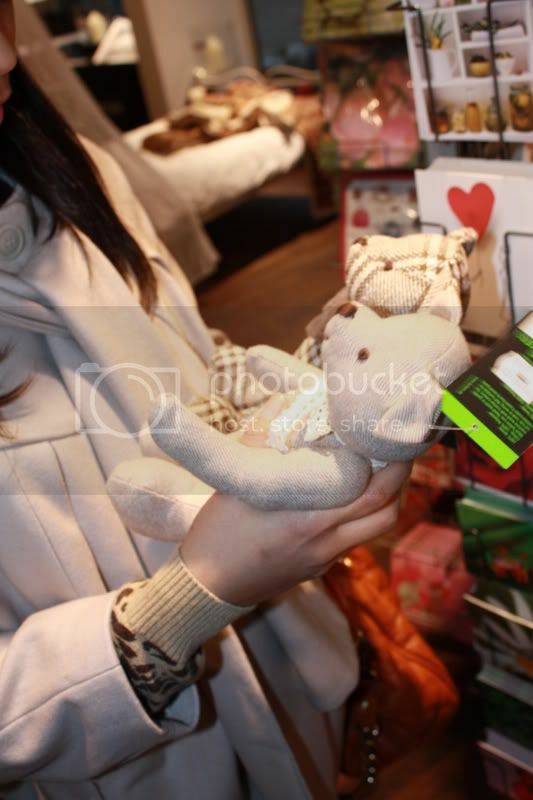 fourthly (i don't think that is a word), we were in town today and i got these crazy cute teddy bears. i could not decide which one, so i got both. did i mention i started to have a secret thing for teddy bears? especially when they look burberry-ish or something. 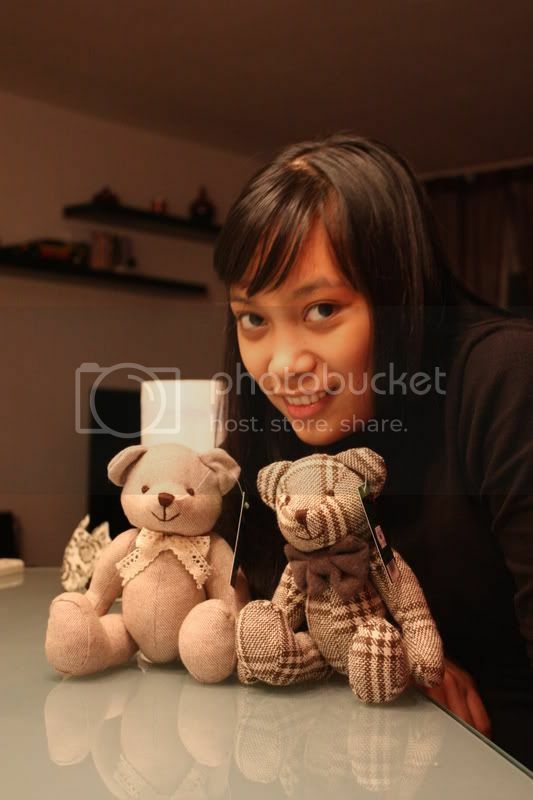 my obligatory 'me and my cute teddies' pose. finally, this is me today. 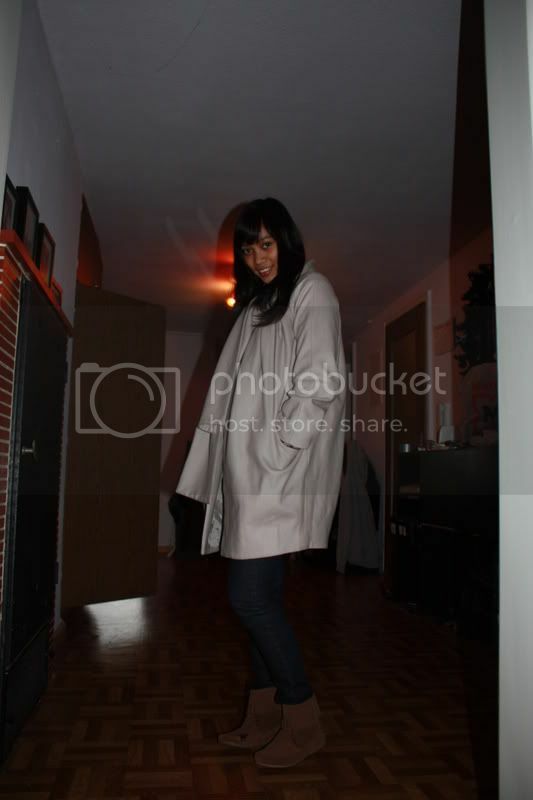 what's underneath that coat, you don't want to see. it's boring to the nth level. ok, i'm gonna stop now. that's what happens when you forget to blog for a day. That *is* a huge ring!! Love the ASOS skirt too, looks awesome. AAAAAAwwwww!! I want one of those teddies!! They are too cute!! Oh! And ur skirt...just perfect! Oh I am in love with that ring!!! And your outfits are stunning! Hey, at least you can always say that they're for Miguel. I have to hide my plush toy habit from the world! The ring is simply fabulous! Statement pieces are the best. And, you know what? We are both proud owners of Laura jewelery now! PS: These pictures are so amazing, they make me want to splurge on a new camera too! 1. That ring is great. What a statement piece. 2. That wish bracelet is adorable. I love pieces like this. 3. This is an extremely cute outfit. I need to get myself a flaired mini like yesterday. 4. I adore these bears, I have dreams of adorning my baby's nursery with millions of little stuffed teddys. Mind you, I have no children. One day. You have by far the most interesting profile story! I'm originally from NY but I lived in Frankfurt for a year working as a designer and never learned german. I'm not a language person..that is the excuse I told myself all year long! Anyways lovely blog. 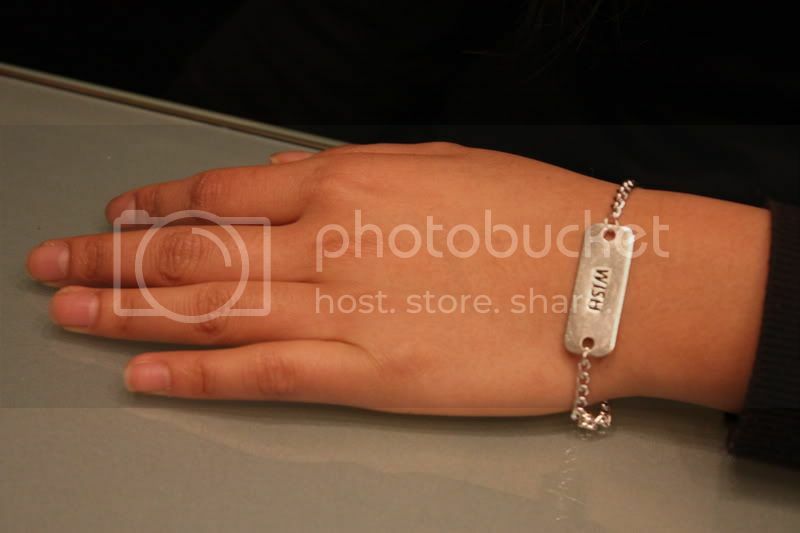 I love that wish bracelet. very dainty. And your baby...so adorable. I love your minnetonkas in the last photo. And those teddies! The grey asos skirt, lace tights and teddies are <3 So are you my dear. LOVE that uber big ring you got!!!! The tights are so great <3 I love your ring! your ring is epic, I have a somewhat smaller version from my nan! It's probably a fifth of the size lol. Love your outfit, it looks like it belongs on a streetstyle blog! am Denise. I just discovered your blog and i love it. I've linked you. Visit me soon. My husband and i will be migrating to NZ this year. Am so excited. btw, i love that ring. It's so diwata! Aawww so lovely teddy bears!!! Aww I love your boots! Love your first outfit and your jacket in the second is unbelievable! You're so right, the ring is gorgeous. sounds like you had quite a life (profile)..
don't be silly. i love when you blab! those teddies are so cute! Baby, baby, baby... the ring is too damn fabulous for words, as is the yummy coat! cute teddies! I love the bracelet and the outfits! those teddybears are freaking cute! and i'm so jealous that u got a new camera. im seriously saving, and saving and secretly hoping my bf would get me a new camera....... which i doubt will happen but oh well.. The Asos skirt is lovely! Shucks thats embarrasing. Oops. But that is a wonderful place to blog. And if you're gettting a bit tired no probs! Just put the lappy aside and scoot yourself down next to your bub! Hope you're having a swell day hun. Cool ring! And cute teddies. 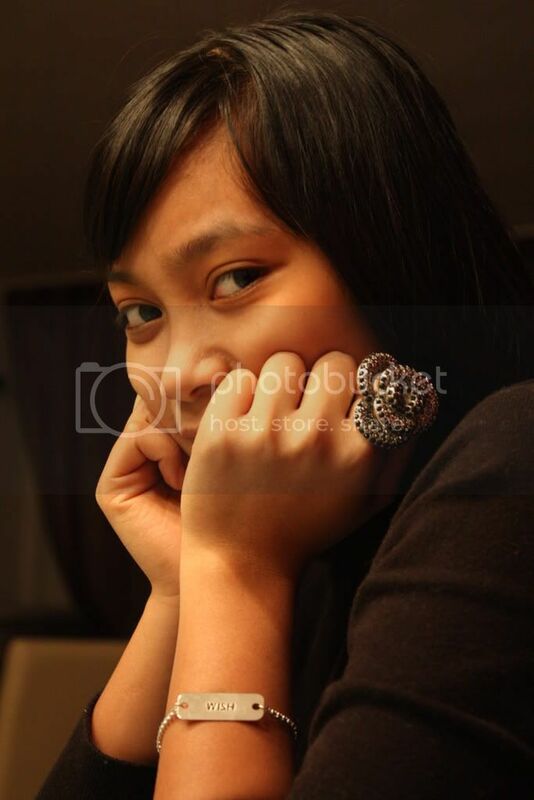 You look stunning, I love the ring. the ring in the first pic is sooooo wonderful! that ring is AMAZING. as is that coat! those teddy bears are too cute! Oh I love the outfit with the skirt and very cute teddy bears! That is very hugemongous.